In 1996, the Dragons heralded in their 75th season in the first grade. Following a series of disastrous events off the field and a mixed start to the year on the field (which included a five match losing streak), the Dragons defied the odds to win 11 out of 12 matches prior to qualifying for the grand final. Saints eventually went down to hot favourites Manly but were far from disgrace, finishing the 1996 season as runners-up. The Steelers had another inconsistent year and this was well illustrated in round 3 when they were crushed 54-4 by Brisbane but backed up the following week to thrash Souths 56-14. Illawarra ended their season in 14th position and nine points outside of the top eight. 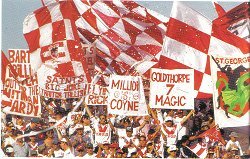 Off the field, the Illawarra club had already rejected the News Limited-backed 'Super League' and remained loyal to the ARL. The club however, was by now experiencing financial difficulties. Following the abortive merger talks between Saints and Easts, and the Save Our Saints-led supporter revolt in 1995, a change of administration became inevitable with CEO Geoff Carr being shown the door and departing at the end of 1995. Popular former player Brian Johnston became the club's new CEO. In late 1995, Brian Smith announced that he will be taking up a coaching job in the UK and will not be seeing out his contract with St George. Although it was an amicable decision, it was clear that Smith was influenced by the uncertain Super League climate and how it would effect Saints' future. In lamenting what he saw as the demise of Saints, Smith was critical of a St George board which he believed had become too conservative..
"It is tragic to see a team that went within a whisker of winning the competition for two straight years being decimated." Smith said. "I think there is a real smell of Newtown to the place." Smith coincidentally began his coaching career in the lower grades with Newtown only a few seasons before the club folded in 1983. A former Saints player, Smith came to St George in 1991 after coaching Hull (UK) and Illawarra. He guided the Dragons to two grand final appearances in 1992 and 1993. Former St George forward Rod Reddy was named as Smith's replacement. Not long after his appointment in late 1995, new coach Rod Reddy abandoned Saints with little notice after he was offered a position with the proposed Super League franchise, the Adelaide Rams. In a parting shot, Reddy claimed in the media that Saints would not last another 2-3 years - Reddy would later be sacked with the Rams' demise in 1998. Former Newcastle Knights coach David Waite is signed as Dragons head coach for 1996. A mass exodus of personnel continued to bring the very existence of the Dragons into question. Matters became worse in early 1996 when most of the playing squad gave notice that they were now training with other clubs. In almost every case, matters were quickly resolved and players returned to the Dragons. To top it off, St George's long term jersey sponsor, Penfolds Wines announced that they were withdrawing their support. Newmans of Kogarah became the new jersey sponsor prior to the 1996 season kicking off. WAV (484 Kb) David Waite talks about becoming new coach. "I am only going to address those thing I can control"
Waite's first training session saw a dismal player turn out. Captain Mark Coyne and Wayne Bartrim (pic right) being amongst the handful of players that stood by the club in the off season. WAV (823 Kb) click here to hear Mark Coyne talk about 1996. 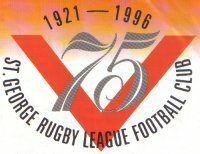 In a year of Rugby League court appearances, St George began proceedings against a number of players that breached their contracts by training with other clubs. In almost every case, matters were quickly resolved and players returned to the Dragons. However, one player, Gorden Tallis refused to front up to training and announced that he wanted to join Super League protagonists, Brisbane. Tallis would ultimately be forced to sit out the year in Queensland as Saints refused to grant him a release from his contract. Following the departure of Penfolds, motor car dealers Newmans of Kogarah became the new jersey sponsor prior to the 1996 season kicking off. Newmans was firstly a sleeve sponsor from 1991. Local businessman and owner of Newmans Motors, Martin Newman, was by all reports a very proud St George supporter. Newman took on the jersey sponsorship from 1996-1998 when the club needed him most. Sydney, 23 February 1996: The Australian Rugby League (ARL) and Super League (SL) took each to court as both sides fought for control of the game. Justice Burchett found in favour of the ARL, the administration that claimed a long association with the game. The News LTD backed SL were claiming restriction of trade and lodged an appeal. Although there were many emotion-charged issues, the main fight seemed to be over advertising and broadcasting rights. The court decision came too late for the first round of the 1996 premiership with six 'breakaway' SL clubs (Brisbane, Cronulla, Canterbury, Canberra, Penrith and the Western Reds) all forfeiting their opening games. 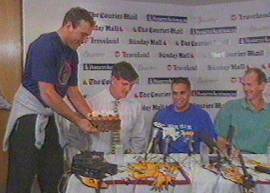 Tallis (left) presents Mundine with a cake as Bennett (right) looks on. Without notice and without his manager, Saints five eighth Anthony Mundine was flown up to Brisbane in 1996 for discussions with Broncos' officials. He appeared on national television with Brisbane coach, Wayne Bennett to announce that he has signed a deal with the Super League franchise for 1997. In an extraordinary display, former St George forward, Gorden Tallis emerged from a side door and presented Mundine with a birthday cake. "The other great mistake we made - and we still feel terrible about it to this day - was the parading him in a Broncos jersey in the middle of the '96 season when he was still under contract and playing for St George. It was bad taste. We got it totally wrong that day." Extract from The Man in the Mirror by Wayne Bennett (with Steve Crawley), 2008. Sydney Football Stadium, 29 September 1996: Competition front runners, Manly have scored four tries to one and defeated St George in the 1996 Grand Final. The turning point happened just minutes before halftime when Manly fullback, Mathew Ridge grubbered a short kick off, regathered the ball and appeared to be tackled by Nathan Brown. However, referee David Manson allowed play to continue and a few moments later, Manly's Steven Menzies scored under the posts. This gave Manly a half time lead of 14-2. In the second half, Saints and Manly scored one converted try each with winger Nick Zisti crossing the rarely breached Manly line. Scrums: St George 8-7; Penalties: St George 7-6; Referee David Manson. 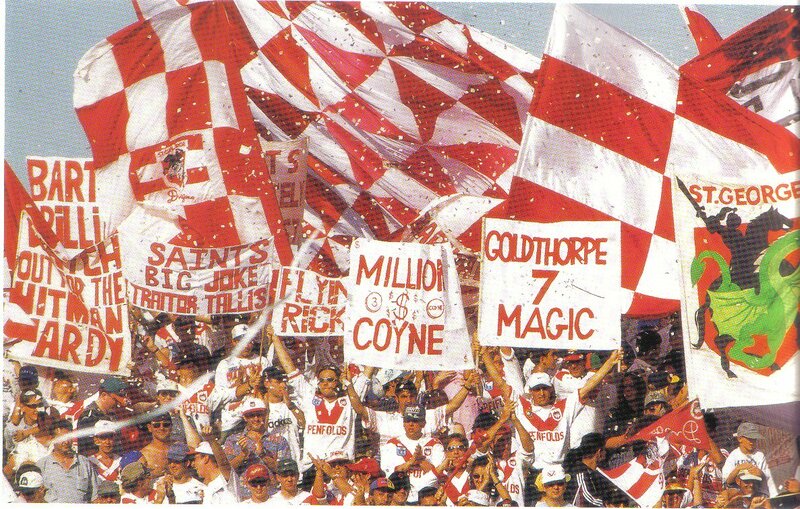 ST GEORGE: Dean RAPER, Nick ZISTI, Mark COYNE (c), Adrian BRUNKER, Mark BELL, Anthony MUNDINE, Noel GOLDTHORPE, Wayne BARTRIM, Scott GOURLEY, Kevin CAMPION, Luke FELSCH, Jeff HARDY, Troy STONE, INTERCHANGE: David BARNHILL, Lance THOMPSON, Colin WARD, Nathan BROWN, COACH: David WAITE. MANLY: Matthew RIDGE, Danny MOORE, Craig INNES, Terry HILL, John HOPOATE, Nik KOSEF, Geoff TOOVEY (c), Owen CUNNINGHAM, Daniel GARTNER, Steve MENZIES, Mark CARROLL, Jim SEDARIS, David GILLESPIE, INTERCHANGE: Cliff LYONS, Neil TIERNEY, Des HASLER, Craig HANCOCK, COACH: Bob FULTON.